Eric Lysdahl is a young, internationally recognized interior designer based in New York City. In a recent New York Times feature, Mitchell Owens wrote the following description of Eric: "Though outwardly mild-mannered, Mr. Lysdahl has a maverick attitude, a sure-footed sense of drama and a belief that breaking away from the past, however painful at first, can lead to a better life. Or at least more exciting decor." After early training as a classical musician and an education in fashion design, Eric enjoyed brief careers in fashion and public relations before finding his niche in the world of interior design. His lifelong talent in drawing (he is an accomplished draftsman), and passion for collecting antiques also serve to enhance his aesthetic sensibilities and skill as a designer. Eric's interiors and furniture designs have regularly appeared in House Beautiful, House & Garden, Elle Decor, Tradtional Home, Hamptons Magazine, Epsaco D'(Brazil), New York Spaces Magazine and The New York Times. Eric has also made frequent television appearances on HGTV's Smart Design and NBC's Open House programs. 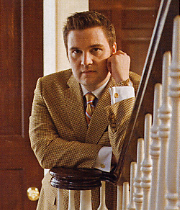 Eric Lysdahl is a graduate of The New York School of Interior Design in Manhattan, and is an ASID (American Society of Interior Designers) member. He gratefully acknowledges designers Lady Henrietta Spencer-Churchill of London and Bunny Williams of New York as being significant mentors in his early design training.